Let each institute of higher education (HE) – university or college – create a working paper archive (WPA) for its alumni. The alumni can be at the level of bachelor, master or PhD, see the Bologna Process at ECAHE for a description of the quality levels. If a university deems someone worthy of a master’s degree then it would be logical to assume that the new master might develop some new ideas, and then it would be useful when those could be archived. Let the institute that granted the degree create such an archive for its alumni. The alumni would not be obliged to use this archive, but having such an opportunity would be a great service to the world. Creating such an archive would serve the purposes of universities and colleges and their libraries on the recording and distribution of knowledge. It would be better when the archive would not only contain drafts for articles submitted to peer reviewed journals, but also versions, research notes and comments, or links to those. These higher education HEWPAs would form the basis of what would be called the “publishing process”. Submission to the database would make the results public. Everyone should be able to read the submission. Potentially there might be an option to time-stamp an idea and keep it secret for a while, but such ideas should become public after the author’s death plus some years. Potentially there might be a protocol for patenting as well. The copyright remains with the author. Submitted material can be read by others but can only be reused with permission for which types of contracts are available. There would be monitoring of citations, comments, versions, and so on. Groups of editors might form journals to serve particular interest groups. They might choose to list only the abstracts with links to the WPA, or assist the author in a new version or new layout. These would be scientific journals and hence open access. There would be no additional costs for publishing or distribution, since the costs of the WPA are paid for by institute of HE. If editing is seen as part of an academic job, then these editors are paid for the institutes as well. The commenting on work by others forms part of scientific research indeed. Trying to make your journal “the best” might be part of unavoidable vanity. The archive function is intermediate between library and press. Many elements in the datebase can be printing on demand. For some publications there can be volume printing, as now happens at university presses. One would suppose that many readers would appreciate quality control by editors for expensive outlays in print. Alumni can also join scientific societies and associations. When these unions are professionally relevant, then the employers would pay for the membership dues. When these dues would be used to support a journal – like the Econometric Society has Econometrica – then this means that the employers would ultimately pay for the editing (or that academia pay for their own editing). This is how it always should have been. There is no need for “commercial scientific publishing”. The current situation with commercial scientific publishing, pay walls and even scientific associations that put their journals behind pay walls to encourage membership to cover costs, are a deviation from sound management of science. It is true that a commercial publisher can put out advertisements and use fancy labels and claims like “this is the best journal” while a scientist is supposed to remain modest. Thus we can understand from historical reasons that we got where we are now, and that scientists washed their hands and allowed publishers to take control, but those are not good reasons. Currently, for example, I use (1) my website, (2) this weblog, (3) EconWPA in the past and now the Munich Personal RePEc Archive (MPRA) for my economics papers, (3) I have some papers at arXiv.org on statistics and mathematics history and overview, (4) for time stamps I also used vixra.org, (5) recently I discovered an archive for Dutch educational materials that also allows English (leermiddelenplein.nl), (6) and there are the “official publications” with their archives. 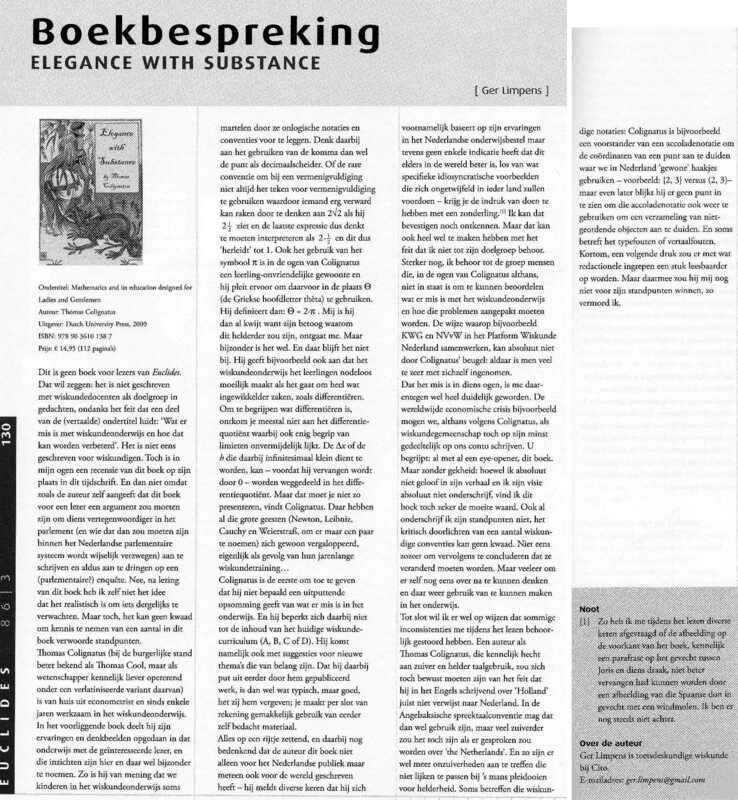 This means that economic texts in Dutch are only archived on my own website, and not indexed etcetera. Will foreigners be able to find the English educational material ? This also means that most of my work on education and didactics of mathematics are achived only on my website, and not indexed as such. I am already member of the Dutch association of teachers of mathematics NVvW, but for access to the journals of the English ATM or US NCTM I would have additional member fee charges or reading fees, while the Dutch council on education research NRO doesn’t provide subsidies for the kind of research (PROO) that I am doing (letter). Fortunately, my work is so creative that I don’t have to rely on extensive search in the literature, but alternatively put, since I cannot do such extensive search, I focus on what I can do, which is being creative. The snag is that my creative work again hits the pay wall, when “open access” journals again require submission fees and/or transfer of copyrights. My impression is that my membership of the Dutch Royal Library should be sufficient to gain access to information all over the world. Why not ? Originally, Bob Parks had an initiative EconWPA at WUStL, modeled after arXiv.org. This worked fine, but WUStL stopped it for administrative reasons. One can imagine that it requires an investment to archive papers in a field for the whole world. I am very grateful to Bob for his efforts in the past, and grateful to MPRA to take it over. This indeed causes the question whether it is useful to archive per discipline or per graduating institute. My impression is that it is better to have the archives at the institutes. They have granted the diploma, and the story starts from there. Over the years an author might shift into a new field but on occasion it would be useful to time-stamp the qualification for that new field. Having an alumni WPA would mean that I could submit this article to a WPA at Leiden University, where I graduated in mathematics teaching. The article explains the algebraic approach to the derivative as originated for education, and provides a bridge for research mathematicians who might be interested to see whether they can develop it further mathematically. Currently, the article is only on my website and not at any archive where it can be indexed etcetera. The article is in English and thus not relevant for the journal Euclides of the Dutch teachers of mathematics. I submitted the article to “Nieuw Archief voor Wiskunde” (NAW), which is the journal of the Dutch society of mathematics, who are mostly research mathematicians (working at the academia). The referee wrote an abusive report. While I referred to the domain of the reals, which are a Field, he or she gave a “counterexample” with a Ring. There are some more abuses. See my letter of protest. The editors of NAW rejected the paper while referring to this referee report. I asked the editors whether they had actually read the submitted paper. I received no reply to this. When they had read the paper, then they could have seen themselves that the report was abusive, and that the referee was dysfunctional, especially when I had pointed out the abuse. This is an abysmal manner of editing. Thus, the paper still is only at my website. If it were at a Working Paper Archive at Leiden University, then editors could be hunting for material, and discover the paper via indexes and abstract and quality of the author. I would not have to look for journals and submit it, and be exposed to such abuse, but quality editors would locate it. The world would be quite different. I wrote my protest the same day when the report arrived. My response is to the point. It expresses sheer intellectual outrage. It doesn’t express the emotions that one feels when one’s work is abused, but it expresses the rational outrage that can be substantiated with arguments. The arguments in my response of October 3 suffice. It is useful to explain a bit more about it. The discovery of the algebraic approach to the derivative dates from 2007 when I retyped “A logic of exceptions” and programmed this in Mathematica, and included a section on the “paradoxes by division by zero”. It is quite a horror show how the mathematics community in Holland has responded to this for almost 10 years now. I have a lot of praise for Richard Gill and Christiaan Boudri but am quite weary w.r.t. others. With this present paper and referee report: had I waited with my response a few days longer, then I might have added the following. It would have made for a longer reply so it is better that I dispatched my response immediately. Yet, let us look at the additional arguments why the referee report is below standard. The referee refers to “sin x“. I already wrote my response that the referee could have asked me before rejecting the article. I could have pointed to “Conquest of the Plane” (COTP) (2011) where this is explained, or the review of COTP by Richard Gill in NAW 2012. Those are both in the list of references, and thus the referee was too lazy to look for this, or ask this. Apparently he or she found sufficient satisfaction in having insulted me for not thinking about trigonometry as the most obvious answer for his or her state of ignorance. However, I would deem that the admission that the algebraic approach would work for polynomials would already be a major reason for publication. The common perception is that limits are required, but if they are not required for polynomials then this is a major step ahead. The referee could have pointed out that the stated objective of the paper is to provide a bridge from education to research mathematics, and then have concluded that the further development might be something for research mathematicians. However, the referee doesn’t see how important this admission is. However, the referee might also have realised that Sin has a Taylor expansion as a polynomial. Obviously, this expansion uses the limit of n → 0, but not the limit Δx → 0 as required for the derivative. My analysis on the algebraic approach to the derivative doesn’t reject limits per se, but only argues the limit Δx → 0 is superfluous. The required information for the derivative is already in the formula for f[x], and it suffices to use algebraic methods. Thus, if the referee had had a first year course in analysis, then he or she should not have made that remark as quoted above. Obviously, the Taylor expansion uses the derivatives themselves, and thus there is the question how this feat of Baron von Münchhausen is achieved. Again, the referee could have pointed out that the stated objective of the paper is to provide a bridge from education to research mathematics, and then have concluded that the further development might be something for research mathematicians. However, I refer to COTP for the deduction. Richard Gill’s review suggests that there is hidden use of limits again in squeezing of values, but, there is actually an application of logic only. Note also that the referee writes “sin x“. However, the sine is defined as the y-value on the unit circle of arc φ on that unit circle, and Cos[φ] is defined as its x-value. Thus “sin x” is gibberish as if x = φ. See my earlier suggestion for a didactic presentation of trigonometry. The problem is rather that the world suffers from mathematicians and their fear for crackpots. I object that I “asked for it”. The quote above concerned “Conquest of the Plane” (COTP) (2011) but the issue is the same for the current paper on the algebraic approach. The paper that I submitted to NAW is an excellent review of both the algebraic approach and the current state of research on this. It fits the stated objectives of NAW to publish the article. The algebraic approach to the derivative a world class discovery, and it deserves to be treated with respect and be published. I never claimed that everyone should agree with everything. The ideas of publication is dissemination and does not imply that the editors agree with the analysis. They would have a useful role in checking on clarity and relevance for the readership. Competition with other articles is less relevant for digital publishing (though NAW is also on paper). I am an empirical scientist and no psychologist. I have a bit more leeway than a psychologist to hypothesize about what is happening here. Earlier I already applied a lay reader’s understanding of social psychology to the world of economics (here or local file). Let me now indicate this for mathematics. My impression is that mathematicians are further up in the autistic spectrum and have difficulty in dealing with conflicting information. They know that everyone in their peer group hunts for crackpots. In the case of conflicting information they consider it their best protection to accuse others of being a crackpot, rather than confront their peers and be accused of being a crackpot too. They have a mortal fear of being associated with crackpots, and then can no longer think straight or treat someone with respect. Addendum 2016-10-11: I now located an actual “autistic spectrum”, namely the AQ questionnaire by Simon Baron-Cohen, see also wikipedia (a portal and no source), and Telegraph 2015. Presumably as a scientist I would be scoring higher on this too, but my point would be that mathematicians are trained to look at formulas at the neglect of empirics, language and humans. In this case mathematicians have been trained to think that limits are required for the derivative (excepting perhaps non-standard analysis). An article claiming otherwise thus provides conflicting information. For me, the referee is anonymous, but he or she is not anonymous for the editors. When they would say “You really liked that article from that crackpot ?” then the referee might feel exposed. For the referee psychological survival dictates the “crackpot-intercepting mode”, with misrepresentation, slander and neglect. For me as a non-psychologist this is a fair description of the mathematics community as I have experienced it throughout my whole life. There is a difference between “(research) mathematics” and “mathematics education”. Research mathematicians, like very likely the editors of NAW and their referee, focus on abstraction, and will have less experience with the empirics of education. Teachers of mathematics have to deal with real-life students, but when those teachers originally have been trained as mathematicians, then those teachers suffer cognitive dissonance, and they resort to traditional ways, that however have not been designed for didactics. The educational programme in mathematics gives ample proof that it is not didactic. This situation can only be caused by teachers who do not observe what is happening with students. As in 2008 I advise each country to have a parliamentarian enquiry into mathematics education. For Holland, a petition is here. Obviously, this involves social psychology, and it is not fair to use the argument “ad hominem”, in which one plays the man and not the ball, like in: “He is a mathematician and thus an autist and thus cannot be trusted.” My argument is quite different. My argument observes the facts of an abusive referee report and a abysmal way of editing, relates this to earlier observations, and arrives at the inference that there must be a common factor. The suggestion that the common factor would be a low quality of my work can be rejected, check some other reviews, and, appreciate the point that this concerns mathematics education so that you can check a lot of formulas and arguments yourself. Society has a serious problem in dealing with the human quality of dealing with abstraction. The hypothesis that mathematicians are higher up in the autistic spectrum, and far too easily resort to the “crackpot-interception mode” (as it euphemistically is called, as it actually involves misrepresentation and slander), fits the observation that name-calling has such a devastating effect within the community of mathematics education. Some people have the attitude that this is just “name-calling”, and that grown-ups should be able to neglect it. I have indeed been accused of being overly sensitive to such “name-calling”. However, in the community of mathematics education, such name-calling is a “call to arms” and invitation to all to get into the “crackpot-interception mode”. I find it only sensible to protest against it, because we are dealing with a community that stops reading well once the first rock has been thrown. The algebraic approach to the derivative was discovered and published in 2007 and the first “review” was in 2010, when Ger Limpens reviewed the book “Elegance with Substance” (EWS) (2009, 2015) in Euclides, the journal of the Dutch association of teachers of mathematics. Euclides is not a scientific journal, but one would hope for fair representation. However, Limpens finds it necessary to wonder whether I would be a wierdo. The Dutch word is “zonderling” and the English translation is “wierdo”, since the English word “eccentric” still has a somewhat favourable sound. Eccentrics may be respected in England but in Holland they are abhorred. The idea that Holland would be a tolerant country is a fairy tale. Limpens found it necessary to inform the readers that the cover of the book reminded him of Don Quixote. The editors of Euclides refused to publish my answer. I am rather convinced that Limpens’s misrepresentation, name-calling and slander about EWS made it easier for others and perhaps inspiration for some to throw other rocks. In the present case, I cannot write to the editors of NAW that Limpens gave a positive review, and in fact, as a scientist I must provide all information and report that Limpens took from the book that I would think that Newton and Leibniz would be dumb people. This, alas, is what the editors of Euclides saw fit to print, and of which I must assume that most of my colleague teachers of mathematics have read. Recently, there was another case of name-calling and reference to Don Quixote, now with respect to the issue when pi or tau “should” be the standard. See my former weblog text on this. Anonymous refereeing as NAW does is an invitation to start misrepresenting. Editors should however also keep in mind that there should be decent treatment of a submitted paper. The latter is important for the citations and career perspectives of the author. Simply referring to other publication possibilities is awkward when a journal like NAW has a monopoly position in Holland. It are my collagues who might wonder: why wasn’t it published in NAW, if it would be so important ? If I were paranoid then I would argue that the editors of NAW already decided that I would be a crackpot, and that they themselves quickly wrote such an anonymous excuse to block the paper, or asked some of their crackpot-intercepting buddies to write such an excuse. But I am not paranoid and only wonder why such a referee should remain anonymous. Above I explained that reviewing the work by others is part of your academic job. Thus let it be known who is performing so badly. This is part of the Elo-rating like in chess, where scores are adapted from game results. The editors of NAW might refer to the case of Limpens. His name is known and I can protest about his maltreatment. The editors of NAW might argue that they want to protect their referees from such protests, as if these referees would only honestly report about their findings when they would have such protection. I doubt whether this is all fair and square. When referees don’t misrepresent, don’t name-call and slander, and don’t neglect or burke, then there should be no problem with arguments pro and con. Then there will be a scientific discussion, as we should all hope for. I already wrote on some aspects before. This text in 2014 suggested to replace arXiv with vixra and PressForward. See here on Timothy Gowers and his boycott of Elsevier 2012. Interestingly, Gowers has now started a journal using the Scholastica platform. Gowers uses arXiv as the farming base, but obviously arXiv can be needlessly selective (in a fear of crackpots), and such a base is lacking for many disciplines, and thus it makes sense to propose that each institute of HE creates its WPA.